Hi, I am interested in your 1969 Chevrolet Camaro (stock #5101-CHA) listed on Autotrader for $32,995. I'd like to get more information about this vehicle and confirm its availability. 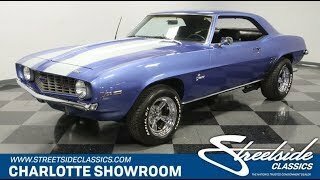 This is a distinct 1969 Chevrolet Camaro with plenty of V8 power and a gone-tomorrow price. So you know you want to check this one out immediately. The color is similar to Chevys Glacier Blue, but with an extra shade of darkness. The nice shine this radiates shows off the crisp curves that make this coupe an icon. So this example has instant distinction that still doesnt look out of place on a classic 69. Of course, it also has racing stripes and a cowl induction hood, and so everyone will always recognize this as a powerful first-gen Camaro. Adding to this performance image are some cool shining upgrades like those long dual exhaust tips and polished and 15-inch polished torque thrust-style wheels with massive rear tires. Inside there have been some nice upgrades for comfort. It includes later-model bucket seats with cloth covers and an AM/FM/CD stereo. But really this one is about performance. Thats why you have a classic Chevy sports steering wheel, Sunpro auxiliary gauges mounted in the dash, and that T-bar shifter is just calling out for your right hand. Chevys small block V8 looks great with the orange block, shining valve covers, and matching air topper all radiating from within the dark engine bay. This 350 cubic-inch V8 inhales deeply with a four-barrel carburetor, and it exhales with authority as long tube headers add power while also contributing to the rumble of the H-pipe dual exhaust. This car balances out performance pieces like the traction bars with comfort in features like the power steering and front disc brakes. And the smooth shifting of the three-speed automatic transmission proves this is great for anytime driving. Complete with maintenance records, this Camaro is powerful, memorable, and affordable. Thats a terrific classic car combination. Call now!